NeverSeconds: Pjila'si (Hello) Veg and Everyone! Pjila'si (Hello) Veg and Everyone! learn to fly fish. We also had iced tea and caramel flavoured yogurt. Bites - about 52. We lost count and had to guesstimate. Sorry. cooked or smoked over a fire. bed. You can leave the head and tail on or cut them off as you prefer. the feeding of the community. These fish are not permitted to be sold. frequently served at spiritual ceremonies. are having venison (deer or moose). Atiu (goodbye) until tomorrow. Jagej. Great recipe! I love salmon. When we lived in Alaska, we would get wonderful wild salmon. In Alaska, state residents are allowed to dip-net into the rivers for salmon. There is, however, a certain limit, which is higher for Native Alaskans (First Nation peoples). as a Canadian on the west coast, this post was really cool and informative! looking forward to more delicious posts. This looks delicious! Salmon is one of my favorites, and I like raw vegetables much better than cooked, too. Thanks for your posts this week! I wish I could grab a chunk of that bannock in the foreground of the bottom picture! Any chance to get a traditional Mi'Kmaq recipe for salmon? Though the one given already - with orange and lemon slizes - sounds real good, it sure isn't how Your people cooked salmon before the europeans arrived. Please refrain from telling people what their culture should or should not be, MaikD. I could find nothing rude or inappropriate about MaikD's comment. If I had I would have left it to Veg, or Veg the Elder to police their own blog. No to Self Appointed Blog Police. Lighten up and let some love in, lotsasmiles. We're all trying to knock down walls, not build new ones. I'm just quite interested in how salmon would have been cooked before there were oranges and lemons available in Nova Scotia. 'cause if it was done with stuff I could get here in Germany - or something very similiar - I'd love to try a traditional Mi'Kmaq meal. I'm a trained cook, which might explain why I'm always trying to find out how different cultures do (or did..) their cooking. I wouldn't rate this a ten/ten on health, maybe an eight/ten, though. Does look good! how wonderful you even found people from Nova Scotia to contribute here. I love that meal but what I like the most in the picture is the fork, the spoon and the place mat. It looks pretty. I will be starting grade 5 this year, like you! I'm wondering about the people pictured- is this a family gathering or a neighborhood group? I love seeing people from different age groups eating together! 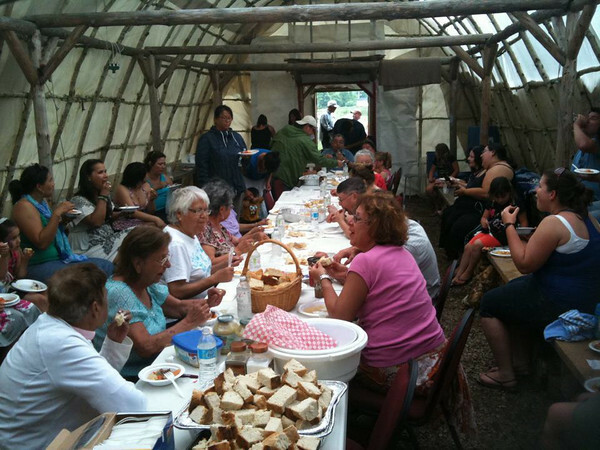 It is a community gathering of many families involving young people and Elders sharing a feast with stories and some drumming ceremonies. A community bonding event over food. I am more and more shocked every time I read these posts about how well informed children around the world are about nutrition. I don't believe that many American children would be able to give a health rating as accurate as these kids do. Actually, I'm not sure many American adults could either.. I am a firm believer in educating people about what they eat, and believe the obesity epidemic in America is due in large part to just plain ignorance about nutrition. 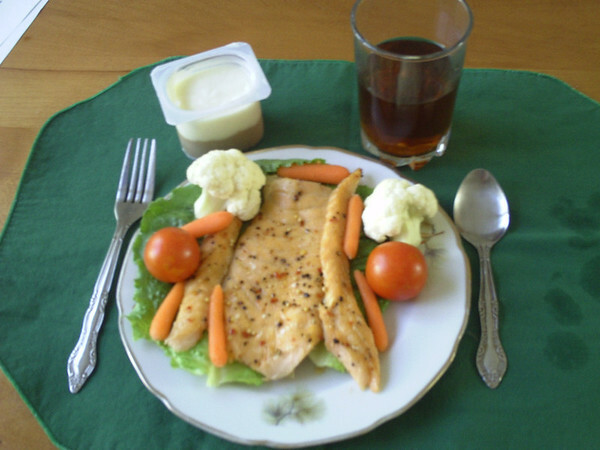 this salmon looks very healthy, vegetables too! thanks for the recipe. I've been following this blog for awhile now and I love it. I love learning about food and culture around the world but am especially loving the opportunity to learn about the Mi'kmaq food and culture. I also live in Nova Scotia but don't know as much as I'd like about Mi'kmaq culture. Thank you Veg for starting this blog and Jagej for contributing. Thanks to everyone else too who contributes.